This Maxima Wagon Is On Death Row, But Phonograph-Based Voice Warning System Lives On! The Datsun 810 became the Maxima for the 1982 model year, but the Datsun-to-Nissan changeover hadn't taken effect yet. 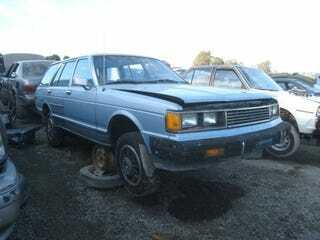 That means you're looking at a very rare Datsun Maxima wagon… and it's doomed. That seems kind of a shame, because this here is a rear-wheel-drive, independent-rear-suspension-equipped station wagon with a big L24 six-cylinder engine. Lots of 280Z genetic material in this car! It's in very nice condition, too, but apparently that wasn't enough to induce anyone to pay $200 for it at the pre-junkyard auction. Of course, you all know why I was poking around in an old Maxima. That's right, I had to take the voice warning system box, which uses a 3" phonograph record for a "brain." Now that I've got two of them, I can set up my Datsun Warning DJ Console and start scratching!